This Metal Gear Survive Hunger and Thirst Guide will tell you how can you find food and water. We will give you numerous tips on how to find water that is clean, find potatoes, and many other things that can be beneficial for your survival. We will also tell you about a trick that can make finding stuff to eat quite easy. 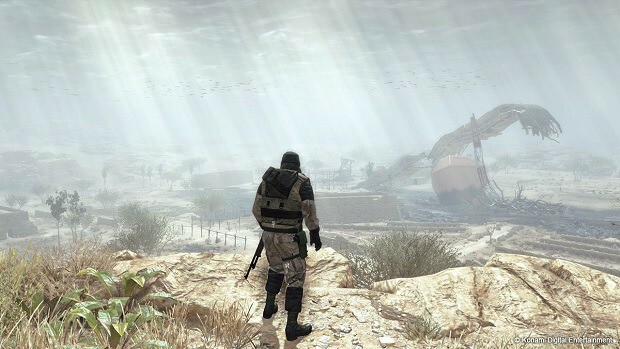 Since the new iteration of the Metal Gear franchise is all about surviving, it is only apt that there is a hunger and thirst element to the game. Finding water that is clean or good that can make you survive can be quite a difficult thing to do. Be sure to check out our Beginners Guide that details everything you need to know about getting started with the game. Food can be hard to find. You might be spending a lot of your time hungry in the game. You will be told the location of some animals at the start, make sure you hunt them down and take the loot to your base. You can also rest at tents to make sure that animals respawn faster. But only do this at most a few times because resting too much will drop your food and water levels. Make sure you make a bow and arrow as soon as you can as that will allow you to hunt birds that are sitting on rocks or trees. Also, remember to never eat raw food and never to waste it. Do not make farms until much later in the game and if your hunger is too low, then go into an online game and get back before finding any members as it will give you 25 food. Water is not that big of a deal. To find water, simply head on over to the body near your base as it will have an almost endless supply of it. All you need is a container such as a canteen or a bottle. The bottle can be found in junk of almost every building. Water may end up making you sick if it is not clean, so if you have something to cure sickness, then drink away to 100 percent and heal the side effects. Otherwise, you can learn how to clean the water using this guide. Looking to earn S-Rank on your Daily Hard Missions? Our S-Rank Guide contains everything you need to know. Remember when we told you that you could use tents to make animals respawn and join online lobbies to get 25 food? Well, how about we combine that? Simply join and quit an online lobby to get your hands on some food and then rest to make the animals respawn. After that, consume the 25 food that you have and then go look for animals to hunt so that you can get more food. You can purify water if you have a Campfire and a Hanging Pot. This will not be possible at the start but soon you will unlock the Wormhole Generator at your base and you will be able to use the construction menu to build a Campfire. Simply pour the water in the Hanging Pot and then use the fire to heat it up until it is clean and totally safe to drink. Lastly, potato farms are a great way to have a constant supply of food. To make a potato farm, you need to find a potato which you can bury. To find the potato, go to the teleporter and then head down the hill until you get into the compound. Inside the compound, you will see a fridge in the center of the area. It is fallen so you may not see it at first. Simply open the fridge and get the potatoes found there. Use two potatoes to make the farms at your base and they will soon be producing potatoes for you to consume. That is all we have for our Metal Gear Survive Hunger and Thirst Guide. Let us know if we missed something using the comments section below!